There are a lot of different pieces that are involved in building a CCENT (Cisco Certified Networking Technician) 100-105 or a CCNA (Cisco Certified Network Associate) 200-125 home lab. You will have routers, switches, serial cards, Ethernet straight-through patch cables, Ethernet crossover cables, serial crossover cables, console cables, usb to serial adapters, rack stands, rack mounts and all kinds of CCENT and CCNA study material to compliment your lab. So you could build out quite a bit of equipment and there are still tons of little ancillary pieces we have not touched on. But today, we are going to focus on a device which has a couple of different names that you might hear it called. That is the mysterious access server or terminal server. An access server or terminal server in a Cisco CCNA lab is primarily there for one reason; to make your lab experience easier and more pleasurable. So you may be asking as many students do what is the access server for and what does it give me access to? Let’s take a step back and maybe I can illustrate how an access server is used and how it will make your lab experience better. We will also cover a few different access server solutions from a Cisco perspective. So you just got your stack of routers and switches delivered to your house and you are setting up your CCNA lab. Whether you have them in a rack or simply stacked on your desk really does not matter for this illustration. So let’s say they are in a rack next to your workstation desk. You crack open your CCNA lab workbook and you start off with the static routing lab that has three routers in it. Generally, the first thing you will do in the lab is to go and set the name of each router. So you will have your console session open on what will be Router1 and you will use the hostname command and change the name of the router. Then step two will be to go to what will be Router2 and change the hostname of that device. So you will have to stop what you are doing, reach over and move the console cable from Router1 to Router2. Then when you go to change the hostname on Router3 you will need to reach over and change it again…then when you go to configure the interface now back on Router1 you will need to reach over and move it again, and then on Router2 again. I think you can kind of get the picture now. You have to continually stop typing to move this stinkin’ cable. It becomes pretty annoying 50 pages into your 425 page CCNA lab workbook. So that is where our access server or terminal server solution comes into play (we will call it an access server from here on out). Basically what an access server is it is a glorified KVM ServSwitch for Cisco routers and Cisco switches. Just like a KVM ServSwitch, you can use hot keys to flip between devices. In this case your Cisco routers and switches. There are many different choices for access servers, but I will cover the three most common Cisco based solutions that you will see in a home CCENT or CCNA lab. The first solution are the Cisco 2509 and 2511 routers. The 2509 is an 8 port access server and the 2511 is a 16 port access server. Accordingly you can connect either up to 8 or 16 devices to the corresponding access server. *Note: The 2509, 2510, 2511 and 2512 models do the same thing. But only the 2509 and 2511 are Ethernet based. The 2510 and 2512 are token ring based but still work just fine if you are not going to telnet into them which you probably won’t be doing in your lab and then those models may save you some money as they are cheaper. Now there are actually two different versions of the 2509 and 2511 routers. There is the plain ol’ 2509 that has one 68 pin async port on the back of the router or the 2511 which as two of these 68 pin async ports on the back of it. On each async port you can insert an octal cable which gives you eight pigtail RJ-45 ends to plug into the console port or your Cisco routers and switches. Now the next solution is the 2509-RJ or 2511-RJ router. Pretty similar to what we had above, right? 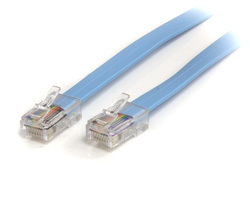 The only difference here is that the 2509 has eight RJ-45 style ports on the back into which you can install one end of a rollover cable into and then the other end would go into the back of your Cisco router or Cisco switch that you want to console into. As you can probably imagine, the 2511-RJ is the same as the 2509-RJ with RJ-45 style ports on the back. The 2511-RJ simply has 16 of these ports. The reason some people prefer the RJ models is that they can customize the length of the rollover cables to suit their individual setup. This is what a rollover cable looks like. Finally, we will cover the NM-16a and NM-32a modules. These are NM modules that can be inserted into a modular Cisco router with an NM slot such as a 2600, 2600XM, 2811, 2821, etc routers. These modules use the 68 pin async modules on them so you can connect an octal cable to them. As I am sure you can imagine, the NM-16a has two async ports so it can support up to 16 devices and the NM-32a has four async ports so you can support up to 32 devices if you are going to have a CCIE lab which is currently requiring 25 devices. So hopefully that helps to take out a little of the mystery of what is an access server. If you are looking to build your own CCENT or CCNA lab, please check out our helpful lab suggestions here.